One of the worst things about falling into the depths of illness was that I wasn’t able to “kick my own booty” at the gym or going for a run to manage stress, anxiety, or just for fun. My husband and I fell in love over numerous gym sessions. Our relationship started because of this shared interest in physical activity, weight lifting and running. Not having that outlet for both stress and connection with my partner felt like a huge loss. 🔅I get it when you tell me that exercise is core piece of your identity. 🔅I get it when you “over do it” yet again and it pushes back your recovery. 🔅I get it when all you want to do is go for a run. I believe this is one of my strongest strengths when working with clients one-on-one...I get where YOU are...because I’ve been there myself. That extra activity you do when everything else for the day has fallen into place. Unlike those who are simply de-conditioned, when you have chronic fatigue, engaging in more activity does not lead to increased energy, function, and ability, rather it thwarts progress. determine how to incorporate exercise. Some of those with adrenal fatigue feel more energetic mid morning or midday, if that is the case, try exercising at this time of the day, but I discourage people from engaging in exercise within 6 hours of bedtime when they suffer from fatigue as your body may not have time to clear the excitatory hormones that were released by the exercise, like cortisol. Think of cortisol as the anti sleep hormone. It directly suppressed excretion of melatonin, the hormone that gets us sleepy and keeps us asleep during the night. So if you’re ready to start exercising during your recovery but where to start? For many people with adrenal fatigue the body’s ability to switch between the parasympathetic (rest and digest) and sympathetic (fight or flight) nervous systems is less than ideal. Eventually if adrenal fatigue progresses, one can develop low levels of cortisol throughout the day, and the body’s release of this hormone is not able to rise to the demands we put on it. As such ideally one’s exercise routine would include training both the parasympathetic and sympathetic systems. Once the body is ready for exercise again. To support the recovery from adrenal fatigue I suggest utilizing restorative practices like yoga, stretching, meditations, deep breathing, Tai Chi, reiki etc. on a regular basis. It doesn’t need to be much, even 5 deep breaths before each meal can make a difference. These types of classes are typically 50-60 mins, that may be too much initially, so start with a 5-10 minute free video on YouTube. When you do take a new class, talk to the instructor ahead of time, let the teacher know you may need to spend a portion of the class resting on your mat, or you may need to leave early. They’ll understand, they want you to be safe and honor your body’s needs. When I introduce more vigorous exercise (anything that can’t be done breathing through your nose) I typically suggest walking first to find out what can be done w/o consequences for the rest of the day or several days thereafter. If I’m told by someone that “when I go grocery shopping (1 hour of walking and moving objects around) I’m pooped for the next 24-36 hours,” I then know an hour of brisk walking is likely going to have a similar impact. So I ask people to try 1/2 that amount. Whatever that amount may be I beg you, please don’t judge yourself for how “little” you can do and push yourself too far; it’s just a starting point...I was guilty of doing this over and over again to myself when I was attempting to reintroduce intense exercise, I totally get it! In fact, I just wanted to share, that even after recovering from chronic fatigue syndrome, it’s not all rainbows & butterflies. I’m still susceptible to relapse. It’s been a very busy handful of months, and although it’s all positive wonderful stuff occupying my time, it doesn’t mean it doesn’t come with a little stress to be over extended. It doesn’t matter if the stress is emotional, physical, or psychological, the body has the same physiological response. 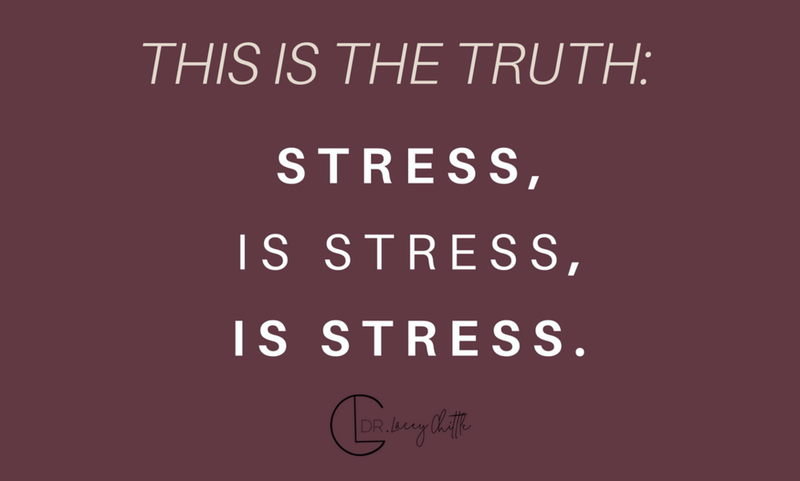 The same stress hormones are released which suppress the immune system’s function, shunt blood away from the digestive organs, & activate the sympathetic nervous system releasing cortisol & potentially draining your adrenals. Yesterday I had planned for a self-care day including an 8 mile run, weight training, lunch with a friend, & getting my nails done. The old me would push through not modifying my workout plan. I’d feel like a failure not completing the planned exercise, & catastrophize the repercussions of failing at this one thing would have meant for every other aspect of my life. I’ve learned from being chronically ill, it’s important to not pushing through, doesn’t serve me & further more will lead me back to a dysregulated immune system & adrenals. These little symptoms are my body’s clues she needs a little more love & support a little more downtime, rest, time with friends. So I urge you to listening to your body, & taking time for yourself. Respect your body’s needs & love it even when it doesn’t respond in the way you want it to. Nurture this body of yours withlove, compassion, & care. If you feel like you need support along your journey, reach out and schedule a 15 minute transformational meeting with me.